Kitchen closes at 11:00pm Sunday – Thursday, and at 12:00am Friday – Saturday. 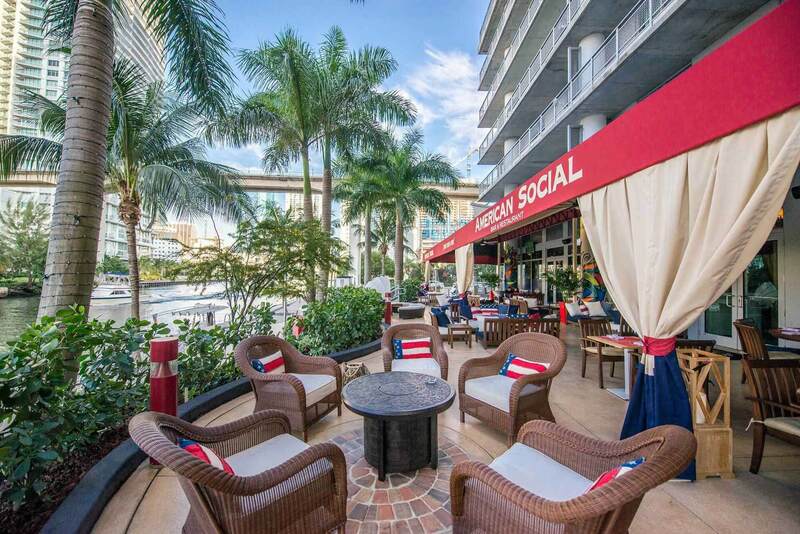 Enjoy the views of the city from American Social's 3,000+ sq ft patio situated on the the historic Miami River. 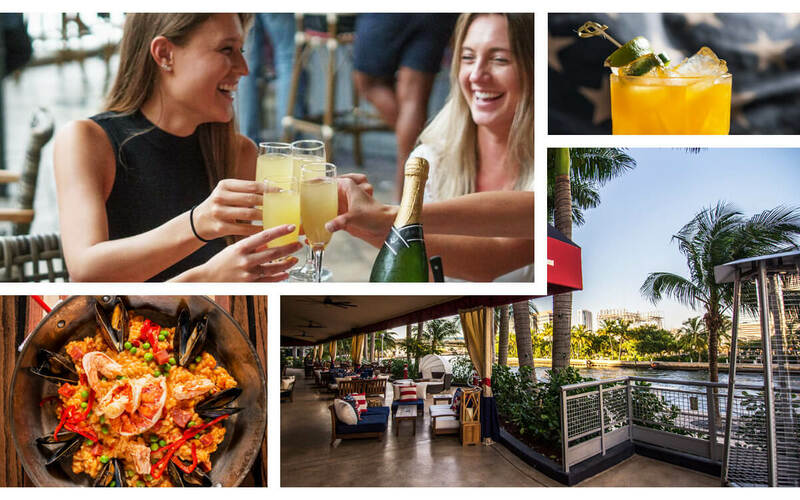 Whether you are looking for dinner with a view, a social night out with friends, or a place to watch the "big game", look no further then Miami's hot spot, American Social Brickell! Follow us on Facebook and Instagram to keep up with our weekly and daily specials! Take advantage of Happy Hour Monday through Friday from 4pm-8pm and Late Night Happy Hour Sunday through Wednesday Night, starting at 10pm! On Monday's, take care of the blues with our $5 #AmSo Burger, indulge in $10 pizzas and take advantage of $10 select bottles of wine on Wednesday's, and get your Cocktail Therapy on Thursday's with $3 Mi Campos Margaritas and Ketel One Botanicals Cocktails! Thirsty for more? We have the best Bottomless Mimosas in Miami and a legendary Bloody Mary prix fixe brunch. American Social Bar & Kitchen is located in the booming downtown Miami neighborhood of Brickell, and we couldn’t love the area more. The buzzing urban center is the perfect home for AmSo, Miami’s best restaurant serving classic American fare. Brickell has been the site of an exciting explosion of growth in recent years, and we are proud to be a part of it. Many of our patrons come into our Brickell sports bar after a long work day at one of the many downtown high-rise offices looking for a place to kick back and enjoy a cold beer. But with all the exciting new development in the area, more people are choosing to spend their days off in Brickell as well. Stroll down the bustling city streets and you’ll instantly be drawn into one of the many hip places to shop. Places like Addict, Shoe Gallery, Rebecca Taylor and even Saks Fifth Avenue offer enough variety to ensure there’s something for everyone. If you’re in the mood for some pampering, stop by the Conrad hotel’s brand-new spa for a Swedish stone massage (and maybe a good nap!). After that, you’ll be more than ready to indulge in some of the classic American dishes and craft beers at American Social. Out of all the bars in Brickell we’re your best choice for eating unbeatable food, drinking beer and watching sports in downtown Miami. American Social, the beloved All-American Restaurant & Bar, opened its doors in Brickell in 2014. The beautiful water front location is the place to be for happy hour drinks, watching the big game, or dining with friends. With an endless selection of craft beers, delicious handcrafted cocktails and self-serving beer tap tables; there’s no better sports bar or restaurant in Miami to kick back and relax. We welcome you and your party to experience the most hospitable dining experience in South Florida. Visit our Brickell restaurant today! American Social is the place to satisfy any craving and more. With it’s own take on American classics, AMSO delivers a casual fine dining experience like no other. From our signature burgers, to organic salads, shared plates and bar nibbles, there’s no better choice for classic American food in Miami!